The EM-Tec sample holders for the Hitachi TM4000, TM4000plus, TM3030plus, TM3030, TM3000 and TM1000 are fully compatible and take into account the stage movements of the original Hitachi stage with X/Y movements of 35mm each way. With the EM-Tec holders, tilt can be added to the sample movements. The EM-Tec sample holders enable quick and secure holding of samples without the use of adhesives. Standard flat Hitachi cylinder stubs with M4 in the the popular 15mm and 25.mm and 32mm diameters. Available with heights of 6 and 10mm. EM-Tec GS24 gripping stub with clamping plate to hold cross section samples or tissue up to 4mm thickness. Sample is held by the clamping plate which is pushed with set screws. Also useful for holding tissue for dehydration and CPD processing. Holder dimensions are 24x12x12mm x M4. EM-Tec HS2 mini M4 cylinder tub/needle clamp. Capacity is Ø2mm maximum, the needle is secured with a small set screw. This holder is ideal for probes, needles, wire and thin tubes. The perfect holder for the Cameca Atom Probe Microscope needle shaped samples. Holder size is Ø15x10mmxM4. EM-Tec HS6 mini M4 cylinder stub vise clamp for sample thickness from 0-6mm. The sample is held vertically with a small set screw. Simple and cost-effective way to clamp cross sections of thin samples. Holder stub size is Ø15x10mmxM4. EM-Tec HS15 M4 cylinder stub vise clamp for sample thickness from 0-16mm. The sample is held vertically with a set screw (multiple lengths are supplied). Cost effective and practical small vise clamp base on the stub size of Ø25x10mmxM4. EM-Tec GB16 with M4 thread. Rectangular type bulk sample holder with two side brackets for sample thickness up to 16mm. Made from brass, 1µm thick gold plated. Ideal for smaller samples and smaller SEMs. Provided with 4 set screws. EM-Tec VS8 is a mini single action spring-loaded vise for samples with a maximum clamping size of 8mm. The vise is opened by pulling the moving vise jaw. Ideal for quickly loading thin cross-sections. The vase base dimensions are Ø25 x 12.5mm height. Made from vacuum grade aluminium with stainless steel rods and springs. EM-Tec TV12 mini variable tilt mount allows 0-90° angle in a small sample mount; available with pin stub or M4 thread. The sample need to be mounted on the tilting platform of this compact holder. Side engravings on the tilting platform assist in setting the desired tilt angle. EM-Tec TV25 larger variable tilt holder allows 0-90° angle for sample stubs or sample holders up Ø38mm. Larger stubs can be mounted, but tilting can be limited, depending on the SEM used. Compatible with both pin or Hitachi M4 threaded stubs or holders. EM-Tec HS16 M4 cylinder stub to clamp round shaped samples up to Ø16mm in diameter. Samples are held by a set screw in the middle of a 25mm Hitachi stub. Holder stub size is Ø25x10mmxM4. EM-Tec H3 multi stub adapter for 3 x Ø15mm Hitachi stubs. Compact and simple multi stub adapter based on the Hitachi Ø25x6mmxM4 stub. EM-Tec B26 wit M4 thread. Rectangular type bulk sample holder with two side bracket for sample thickness up to 26mm. Made from vacuum grade aluminium. Provided with 8 set screws. EM-Tec H45P fixed 45° tilt holder for standard and Zeiss pin stubs. Image sample surfaces or cross sections directly under 45° w/o having to use the tilt on the SEM stage. Particularly useful for table top SEMs without tilt facilities or to extend tilt angles for limited tilt stages. Overall size is Ø12.7x17mmxM4. EM-Tec MV22 combined compact vise holder (0-22mm) plus multi pin stub holder for up to 5 standard 12.7mm pin stubs. This cost-effective multi holder has been designed for table top SEMs and SEMs with smaller specimen stages. One fixed jaw and spindle drive to move other jaw. Made from vacuum grade aluminium, brass spindle and stainless steel screws. EM-Tec H45 fixed 45° tilt holder Hitachi M4 cylinder stubs. Image sample surfaces or cross sections directly under 45° w/o having to tilt the SEM stage. Particularly useful for table top SEMs without tilt facilities or to extend tilt angles for limited tilt stages. Overall size is Ø12.7x17mmxM4. EM-Tec SC1 SampleClamp with a clamping area of 15x10mm. Small and thin wire, strips, fibers, cables can be clamped down with the strips at the side to examine the outside surface. No use of adhesive keeps the surface clean and allows for rotating the sample to examine the sample at different angles. EM-Tec M26 metallographic mount holder for holding Ø25mm or Ø1” metallographic or petrographic mounts with embedded samples, M4. EM-Tec GR20 with M4 thread. 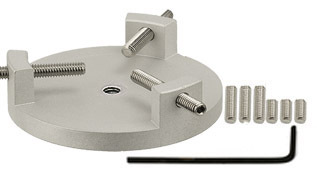 Round type bulk sample holder with three brackets for round and awkwardly shaped samples up to Ø20mm. Made from brass, 1µm thick gold plated. Ideal for smaller samples and smaller SEMs. Provided with 6 set screws. EM-Tec SC2 SampleClamp with a clamping area of 25x15mm. Longer and thicker wire, strips, fibers, cables can be clamped down with the strips at the side to examine the outside surface. No use of adhesive keeps the surface clean and allows for rotating the sample to examine the sample at different angles. EM-Tec M32 metallographic mount holder for holding Ø30mm, Ø32mm or Ø1-1/4” metallographic or petrographic mount with embedded samples. EM-Tec SC2R SampleClamp with a recessed area of 25x15mm. The recessed part leaves the sample area to be examined fully free standing. This allows for a complete rotation of the sample to examine all sides. The recessed area tends to be out of focus which leaves more emphasis on the sample. Tip: to avoid signal from the recessed area, one could place a carbon disc underneath the sample; this will greatly reduce both electron and X-ray signal. 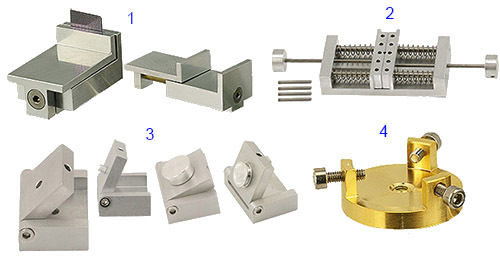 EM-Tec HS3 mini M4 cylinder stub SampleClamp to clamp thin samples, foils, Si wafer pieces etc. directly on the stub. Samples are held down by a washer under the small screw. More effective and cleaner than using tape or conductive paint/paste. Holder stub size is Ø15x10mmxM4. 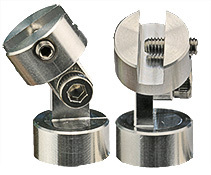 EM-Tec HS19 swivel stub vise clamp for sample thickness from 0-16mm. The sample is held with a set screw (multiple length are provided). The swivel hinge allows close to 90° tilt both ways. Holder size is Ø25x30mm xM4. EM-Tec HS18 mini swivel split mount vise for samples up to 8mm thickness. The sample is held between the mini vise clamps. This swivel holder allows can be tilted 90° both ways. Holder size is Ø15x30mm xM4. EM-Tec HS17 mini swivel vise holder for sample thickness up to 4mm. 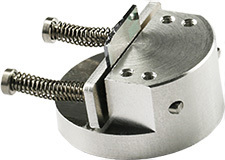 Sample is held with a set screw; ideal for Si chips and thin sample cross sections. This swivel holder allows for full 90° tilt both ways. Holder size is Ø12x23mm xM4. EM-Tec HGS10 swivel head sample holder is made from gold plated brass to enable easy cleaning and to resist contamination. Maximum sample thickness is 10mm; sample is clamped with two thumb screws. Sample can be clamped from opposite ways. This swivel holder allows for full 90° tilt both ways. Holder size is 28x16x32mm x M4. EM-Tec HSM4 swivel mount adapter with M4 screw accepts small Hitachi stub and Hitachi sample holders with an M4 threaded hole. 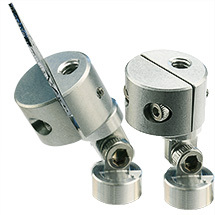 The swivel hinge allows for tilting 90° both ways to investigate samples at different tilt angle. Cost effective way to turn stubs and small holders into swivel stubs and swivel holders. Adapter size is Ø9x20mm. EM-Tec HS9 mini split mount vise clamp for sample thickness from 0-8mm. The sample is clamped between the two jaws of the split mount. The split mount vise jaws are closed by two allen screws. 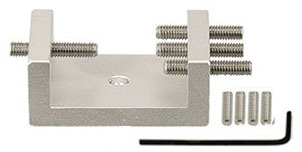 Closed mini split mount vise dimensions are Ø15x10mm; when opened 24x15x10mm. EM-Tec HS15 Hitachi swivel stub mount. The head of the mount is attached to the cylinder stub via a swivel hinge which allows for 90 degrees tilting each way. Can be rotated 360 degrees in the cylinder stub. Excellent mount for SEMs without tilting facilities or when random tilt angled are needed. When the desired tilt angle is set, the top is secured with a socket cap screw. Top diameter is 15mm and the total height is 30mm. 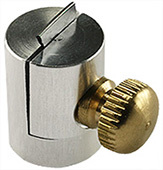 EM-Tec H15P M4 adapter for pin stubs for standard and short Ø3.2mm diameter pin stubs. The stem of the pin stub is secured with a set screw. Allows for using the popular pin stubs on Hitachi and JEOL Neoscope table top SEMs. Machined from vacuum grade aluminium. Overall size is Ø15x16mm. Includes allen key. EM-Tec HS-4 M4 adapter for holding Cambridge S4 mounts. Screws are used to secure the Cambridge S4 mount. Machined from vacuum grade aluminium. Overall size is Ø30x10mm. EM-Tec HJ10 Hitachi M4 adapter for holding the Ø9.5mm JEOL stubs. Set screw is used to secure the Ø9.5mm JEOL stubs. Machined from vacuum grade aluminium. Overall size is Ø15x10mm. Includes allen key. Hitachi M4 adapter for holding the Ø12.2mm JEOL stubs. Set screw is used to secure the Ø12.2mm JEOL stubs. Machined from vacuum grade aluminium. Overall size is Ø15x10mm. Includes allen key. EM-Tec HJ12 Hitachi M4 adapter for holding the Ø15mm JEOL or ISI stubs. Set screw is used to secure the Ø15mm JEOL or ISI stubs. Machined from vacuum grade aluminium. Overall size is Ø25x10mm. Includes allen key. EM-Tec HJ25 Hitachi M4 adapter for holding the Ø25mm JEOL stubs. Can also be used to hold the Hitachi Ø25mm stub or Ø25mm/1inch metallographic mounts. Set screw is used to secure the cylinder stubs. Machined from vacuum grade aluminium stubs. Overall size is Ø34x10mm. Includes allen key. EM-Tec HJ32 Hitachi M4 adapter for holding the Ø32mm JEOL stubs. 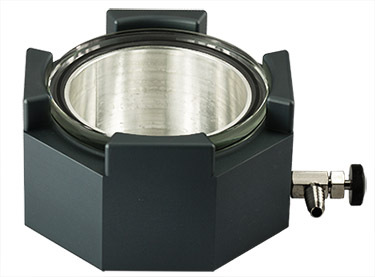 Can also be used to hold the Hitachi Ø32mm stub or Ø30mm/1.25inch metallographic mounts. Set screw is used to secure the cylinder stubs. Machined from vacuum grade aluminium. Overall size is Ø40x10mm. Includes allen key.